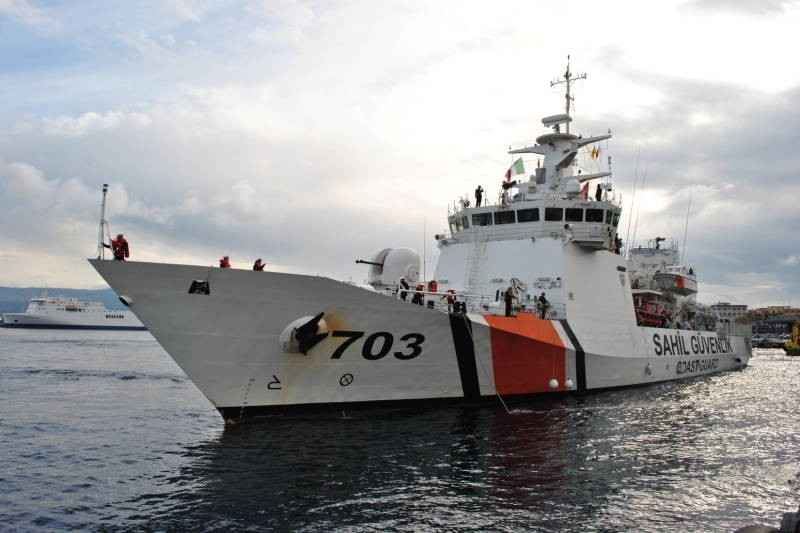 Turkish Coast Guard vessel SG-703 TCSG Umut is making her first foreign port visit to Messina, Italy. This might be the first ever visit of a Turkish Coast Guard vessel to Italy. Under the Plan of bilateral cooperation between the Turkish and Italian Coast Guard to allow the exchange of information and mutual experiences in the areas of search and rescue (SAR), control of migration flows and vessel traffic (VTS system operation), control Fisheries and contrast modes marine pollution and illegal trafficking of waste, arrived this morning at the port of Messina the Turkish Coast Guard Ship TCSG UMUT (703). The Turkish patrol the high seas is a unit of 88.80 meters at whose command is placed Lieutenant Commander Cuneyt KARA. The mission commander is Captain Ertan BALCI. The crew consists of 90 people including 15 officers. The unit was met at the dock and then the Turkish delegation was received by the Commander Master CV Samiani, in the presence of the Commander of Maridist CV Legrottaglie. During the morning were then made protocol visits to the Port Authority, the Mayor of Messina and the Prefect. The command of the ship then called the authorities on board for lunch. The choice of which port of call in Messina Unit was motivated by the opportunity for crew members to visit both the Italian Coast Guard vessels stationed in the port of Messina, both the Centre and the School of VTS Messina. Tomorrow will be made some visits to structures and naval units of the Coast Guard, under the command of Paul ZUMBO CV and the Navy found in Messina, as well as social and sports activities will be held joint. Messina is a fitting place for TCSG Umut as she is based on Sirio class OPV vessels of Italian Navy. Besides Italians naval enforcement agencies face very similar challenges like their Turkish counter parts therefore establishing operational relations ships and exchanging experiences will mutually benefit all parties. The Dost class vessels are the largest vessels ever used by Turkish Coast Guard and have longest range of all coast guard units. Thus Turkish Coast Guard needs to establish procedures for long-range deployments and need to learn their ships capabilities and limitation is the open seas.